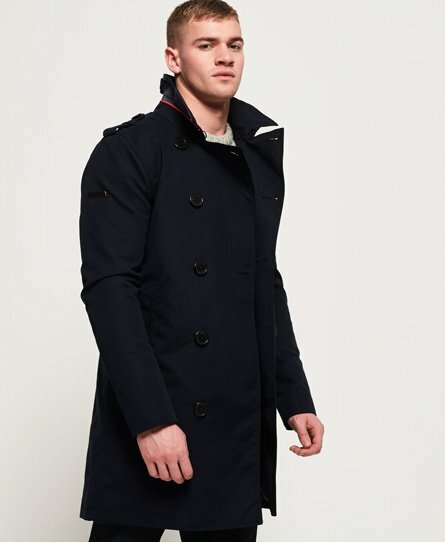 Superdry men’s summer rogue trench coat. Crafted with premium quality fabrics, this trench coat is in a lightweight design, making it the perfect trans-seasonal cover up. Inspired by British military design, this coat comes with all the traditional detailing of a classic trench coat, such as the double-breasted button fastening, shoulder epaulettes and storm shield, which helps rain to run off the coat to keep you dry. In addition to these military inspired details, the Rogue trench coat also features two front popper fastened pockets and two practical internal pockets, perfect for keeping your wallet safe. This trench coat also features a contrasting undercollar with buckle detailing to help keep the collar in place, a tailored waist and a back split for ease of movement. The Summer Rogue trench coat is finished with Superdry logo badges on the sleeve and pocket. Wear this coat with a crisp shirt and chinos for a smart, office-to-dinner look.